Happy Chinese New Year 2019 The Year of the Pig In 2019, Chinese New Year begins on February 5th and ends February 19th. Years of the Pig include: 1935, 1947, 1959, 1971, 1983, 1995, 2007, 2019 The Pig is the twelfth of the zodiac animals. 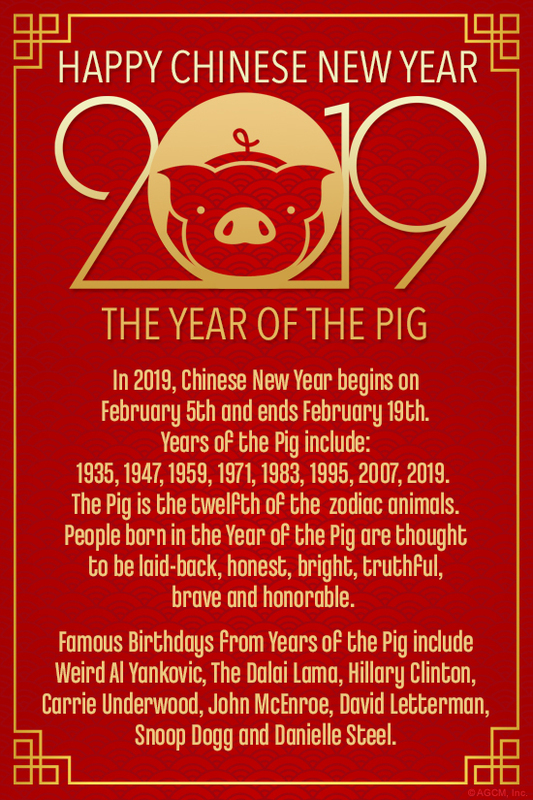 People born in the Year of the Pig are thought to be laid-back, honest, bright, truthful, brave and honorable. Famous Birthdays from Years of the Pig include Weird Al Yankovic, The Dalai Lama, Hillary Clinton, Carrie Underwood, John McEnroe, David Letterman, Snoop Dogg and Danielle Steel.